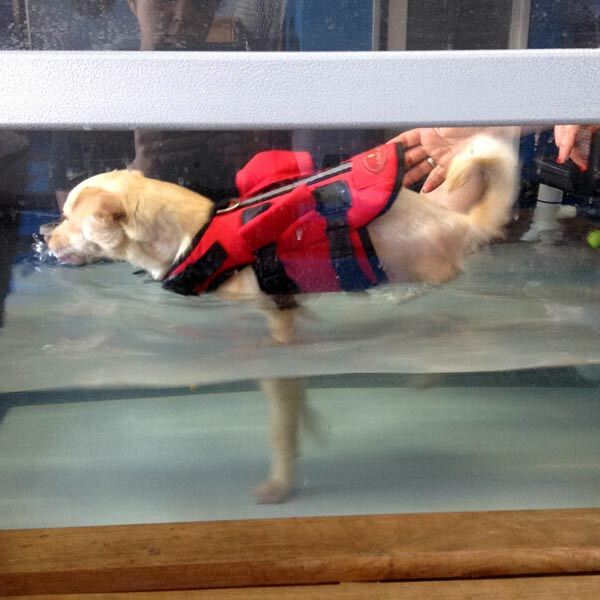 Tripawds Community member sunnyboy1 is the latest recipient of the Maggie Moo Fund for Tripawd Rehab. Read on for details about Carlos and Eman’s experience with rehab for Sunny Boy, and please consider a small contribution to help keep this program going! Early in February, we met and fell in love with a three-legged puppy at the San Francisco SPCA, who had lost his leg only a short while prior from being run over by a truck. His extremely cheerful demeanor and affectionate personality inspired us to call him Sunny Boy. Sunny Boy is a 13-pound terrier-chihuahua mix estimated to be about a year old, although we believe he could be younger as his third molars haven’t completely erupted. During our visit with Dr. Strubel, CCRT at A Well Adjusted Pet, we learned about the vital importance of keeping Sunny Boy in good physical shape so he can avoid complications later on in life. 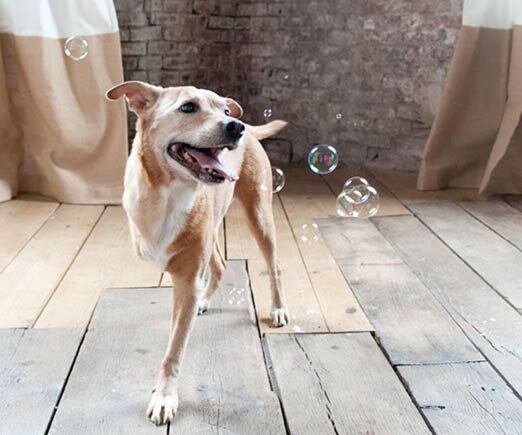 We were told that weight gain can be a significant problem on three legs, leading to arthritis and other aches and pains which may reduce Sunny Boy’s energy level and mobility. 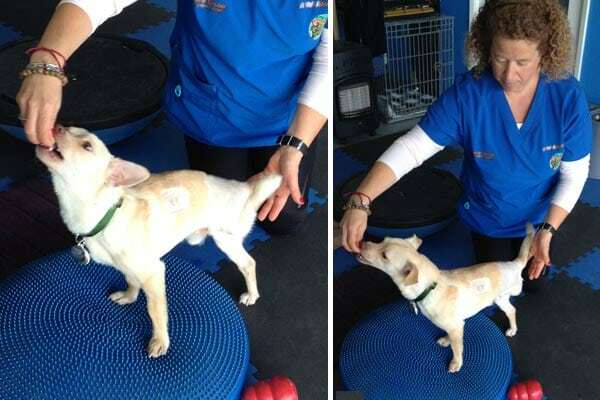 Dr. Strubel demonstrated various exercises to help Sunny Boy learn to stretch out his neck and straighten out his spine while keeping him balanced on a partially inflated disk. Luckily, we leave near the beach, and walking in sand is apparently a very good way for Sunny Boy to strengthen and use his only hind leg effectively. We try to include walking in moderately deep sand as a regular part of Sunny Boy’s weekly walking routine. She also had Sunny Boy walk on a treadmill at a brisk pace while submerged neck-deep in water. The visit with Dr. Strubel has been an eye-opening experience for us, which we hope has made us much more sensitive to life on three legs. During the short time we have had the bounty of knowing Sunny Boy, we have discovered that he LOVES to run fairly long distances incredibly fast, which indicates that he is adapting very well and feels comfortable with his physical condition. Also, when he walks at a fairly fast pace, his spine becomes almost completely straight, and he seems to have the gait of a normal, four-legged animal. We have become very conscious of Sunny Boy’s posture and try to help him maintain a confident and well-balanced stance as often as possible. We will continue the exercises we have learned with Dr. Strubel and look forward to many healthy and happy years with Sunny Boy. Very cool. Thanks for sharing your learnings. Sounds like Sunny Boy has a great led ahead of him! I’m in love with Sunny Boy! What a cutie pie!! Sooo glad you are giving him his furever home! He is a very lucky boy!! Thanks for sharing this informative update…and joyful update!! Keep on rockin Sunny Boy! Would love ro follow yiur journey here with more pictures (of course)!